The Advanced Encryption Standard is the most widely used encryption algorithm today. Its fast and secure but also easy to understand and implement. He did a great job with all 4 parts, but I thought elaborating on the implementation would be helpful. In this post, I will only assume you’ve read Acts 2 and 3 and signed the foot-shooting-prevention agreement. The implementation of AES involves doing a set of simple operations repeatedly. Each repetition is called a “round”. Depending on the size of the key (128, 192 or 256 bit), the input (block of 16 bytes) goes through 10, 12 or 14 rounds. In applying the 2 Big Ideas - Diffusion and Confusion, AES makes sure that each bit in the 16 byte block depends on every bit in the same block from 2 rounds previously. That’s quite the achievement, so lets speak about the operations in detail. The 16-byte block, called state is represented as a slice of 4 4-byte unsigned integers. The 4-byte unsigned int is also referred to as a “word”. The expanded key is based on the original key. Its 16*(rounds+1) bytes in length. All the 4 operations are invertible. If you took any random 16-byte state and applied any operation and its inverse, you’d get back the original state. This is how decryption is a simple mirror of the encryption process. For invSubBytes, only the lookup table is changed. The code is input[i] = invsbox[input[i]]. The values for both lookup tables can be found on the wiki page. If this step appears really simple, its because it is. Nevertheless, I’d suggest writing a test to check if its working correctly. Another useful test would be to apply subBytes and invSubBytes on 16 random bytes and check if you get back the original. invShiftRows is the inverse operation. The top row is left untouched and the next 3 rows are shifted right by 1, 2, 3 bytes. Again, I’d recommend writing a test to ensure that applying both shiftRows and invShiftRows to random bytes returns the original. This step is slightly complicated, compared to the other 3. The state is operated on column-wise. Each byte of the column is replaced based on an operation. As you’d expect, in invMixColumns the 4 bytes are replaced by the 4 original ones. Speaking about the operation itself, it involves multiplication and addition in the Galois field. That sounded arcane to me, until I realised that I can get the results of multiplication via a lookup table and addition is just bit-wise XOR. For invMixColumns, the test vectors are simply reversed. As with the other steps, it’s a good idea to check if your mixColumns and invMixColumns invert each other. I’m not going to explain Galois field arithmetic here for 2 reasons: I’d prefer to keep this post short, and its not necessary to know exactly how it works while implementing AES. I do recommend reading this book by the creators of AES if you’re interested in that or other interesting topics like cryptanalysis of AES. The simplest of all the steps. A bit-wise XOR between the 16-byte state and the appropriate 16-bytes of the expanded key. As you probably know, XOR-ing any input with the same key twice returns the original input. That’s why we use the same operation with the same key in both encryption and decryption. Be careful of how you fill the state matrix with your 16 bytes of input. If you haven’t yet managed it, you could check out the FIPS-197 Document which elaborates on each step. aes.go - encrypt(), decrypt() and all helper functions. aes_test.go - test vectors for each step. const.go - S-boxes and the Galois-field multiplication lookup tables. 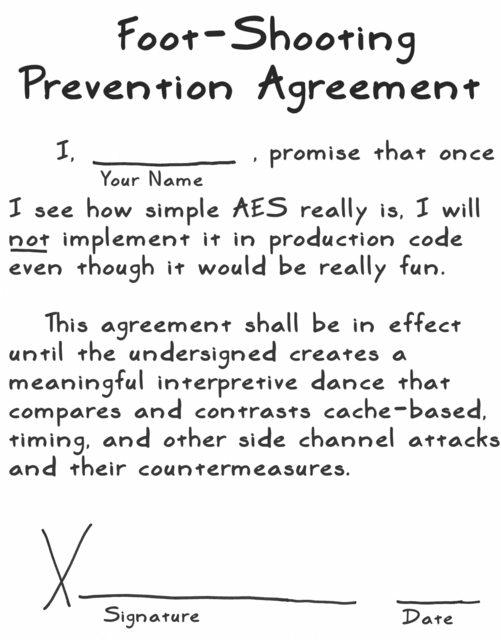 The caveats mentioned in the foot-shooting-prevention agreement apply to my code as well. The linked code is useful for learning about AES, but is not secure and should not be used to encrypt anything important. 0kB - no lookup tables, all steps are calculated, including substitution. 256 bytes x 2 - s-box and inverse-s-box are stored as lookup tables. 24kB x2 - The entire round (subBytes, shiftRows and mixColumns) are replaced by a lookup table. The only operation left is addRoundKey. The last is the fastest possible software implementation. Such an implementation can be found in the Go standard library here. If the CPU’s cache is large enough to accommodate the entire table, it will be really fast. The Go Standard Library also has an implementation that uses these instructions. I hope you found this post useful. I had a lot of fun learning about AES and implementing it and I wanted to share it with as many people as possible.